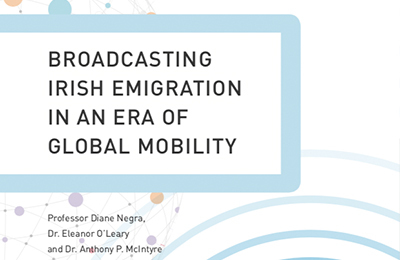 The Broadcasting Authority of Ireland (BAI) has welcomed the launch of a joint Institute of Technology Carlow & UCD research report, entitled Broadcasting Irish Emigration In An Era Of Global Mobility, published by Dr. Eleanor O’Leary of IT Carlow, and Prof. Diane Negra and Dr. Anthony P. McIntyre of UCD. The report was funded under the 2016 BAI Media Research Funding Scheme. Broadcasting Emigration in an Era of Global Mobility highlights how, for a new generation of migrants who left Ireland since the downturn of the economy in 2008, Irish media content, including broadcast television as well as emerging social media formats, has become increasingly essential in maintaining links to family and friends at home and sustaining their sense of Irishness while abroad. The research found that emigration was largely absent as a subject of television drama, finding its most prominent representation in various non-fiction popular genres. Further, the research highlighted that such programming was almost exclusively focused on the lifestyles of a minority of migrants who had achieved considerable financial success abroad while under–representing average migrant experiences around the world.